Please read our terms and privacy statement which is the basis under which we operate. The company operates as an online booking portal for Car Hire and Airlines ticketing. Location: Kraaifontein, 7570, Northern Suburbs, Cape Town South Africa. Operating as a Sole Proprietor based in Cape Town having been founded in the year 2000. We operate under the laws of South Africa and any legal litigation will be conducted and concluded within the laws of South Africa. We have agreements with various Car Hire and Airline agents who we promote. We negotiate better rates/fares etc with these companies and pass them on to our clientele. Clients are directed to book their requirements directly online through our agreements with our suppliers. All Payments are paid directly to our suppliers. Privacy: At no stage do we, Carhirecapetown, ask you for any personal information nor do we sell any information onto any other marketing company etc. We do on occasion send you newsletters, specials or other non-personal information. When making any bookings through our suppliers we cannot be held liable for whatever the supplier chooses to do or not do with any information gathered from yourself. Their privacy statement would apply. We act as agents/brokers for the Car Hire and Airline industry. We have neither Authority nor power over our suppliers and their company terms and condition will at all times apply to all parties. 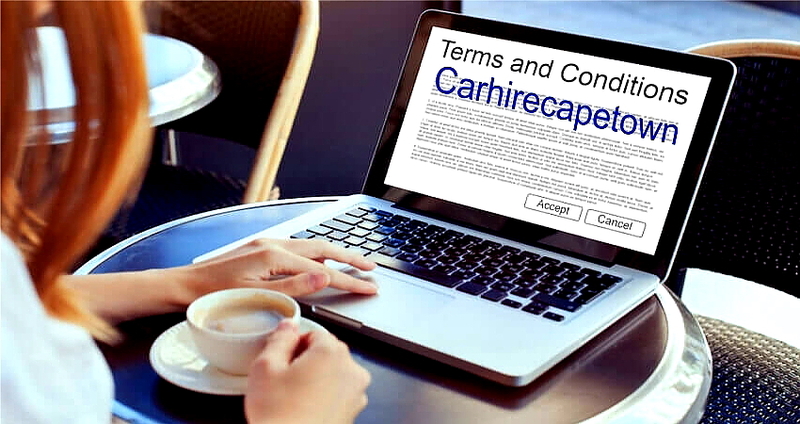 Irrespective of the above Carhirecapetown retains the right to change/modify any terms and conditions with or without notice as situations may require.